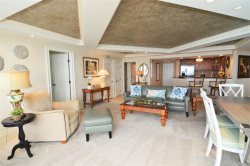 Escape to this beachfront vacation rental at Sanibel Harbour Resort. This sweet 2 bedroom 2 bathroom condo has been completely remodeled in early 2016. The coastal inspired unit has tile throughout with all new furniture, bedding, flooring, and stainless steel appliances in the kitchen. Nautical artwork in the living room brings the outdoors inside. Wall mounted flat screen televisions in the living room and both bedrooms. King bed in the master and two twins in the guest room along with a sofa sleeper in the living room. Enjoy from your living room the view of the beach and nightly sunsets. We loved this place! It was perfect for me and my husband and our 3 kids ages 2, 6, & 10. The pool was great. The condo was so peaceful. We loved sitting on the balcony and watching the water. We even saw dolphins a few times. The view is incredible. The only thing missing was a Keurig- which we actually purchased one for the condo and left it there for future guests:) We stayed 2 weeks and it was Wonderful!! We shared a concern about a spot in the master bath shower with a gentleman in the office and he passed it along to Kara. She came and took pictures and will address it. Both were so nice and helpful. Unit could use pot holders and some barbeque utensils. We had a wonderful time and just loved our unit! The furnishings and the view were just the best! And we really liked the location of the complex and proximity to everything. I had a great time. Rooms and properties are clean and very well maintained. The pool was a little warmer than I'm used to but, I guess that's Florida life. Overall I didn't find anything to complain about. Highly recommended.